One hundred and twenty-three nations voted to move forward with negotiations to prohibit nuclear weapons—just as the world has already done for biological and chemical weapons. In a historic vote on October 27 at the United Nations Committee for Disarmament, what has long seemed to be hopelessly clogged institutional machinery for abolishing nuclear weapons was upended when 123 nations voted to move forward with negotiations in 2017 to prohibit and ban nuclear weapons just as the world has already done for biological and chemical weapons. Civil-society participants broke out into cheers and shouts of jubilation in the normally staid halls of the UN basement conference room, accompanied by beaming smiles and muffled applause from some of the leading government representatives in the room, which included Austria, Brazil, Ireland, Mexico and Nigeria, along with South Africa, who had drafted and introduced the resolution, then sponsored by 57 nations. The most stunning realization after the vote was posted was the apparent breach in what had always been a solid, single-minded phalanx of nuclear-weapon states recognized in the Non-Proliferation Treaty (NPT), signed 46 years ago in 1970—the United States, Russia, the United Kingdom, France, and China. For the first time, China broke ranks by voting with a group of 16 nations to abstain, along with India and Pakistan, non-NPT nuclear-weapon states. North Korea actually voted yes in support of negotiations’ going forward to outlaw nuclear weapons. The ninth nuclear-weapon state, Israel, voted against the resolution with other 38 countries, including those in nuclear alliances with the United States such as the NATO states as well as Australia, South Korea, and, most surprisingly, Japan, the only country ever attacked with nuclear bombs. Only the Netherlands broke ranks with NATO’s unified opposition to ban treaty talks, as the sole NATO member to abstain on the vote, after grassroots pressure on its Parliament. All nine nuclear-weapon states had boycotted a special Open Ended Working Group for Nuclear Disarmament last summer, which was established at the 2015 UN General Assembly following three conferences in Norway, Mexico, and Austria with civil-society and government representatives to examine the catastrophic humanitarian consequences of nuclear war, opening a new pathway for how we think and speak about the bomb. The recently launched humanitarian initiative has shifted the conversation from the military’s traditional examination and explanations of deterrence, policy, and strategic security to an understanding of the overwhelming deaths and devastation people would suffer from the use of nuclear weapons. Today there are still 16,000 nuclear weapons on the planet, 15,000 of which are in the United States and Russia, now in an increasingly hostile relationship, with NATO troops patrolling on Russia’s borders, and the Russian Emergencies Ministry actually launching a sweeping nationwide civil-defense drill involving 40 million people. In the United States, President Obama has announced a $1 trillion program for new nuclear-bomb factories, warheads, and delivery systems, and Russia and other nuclear-weapon states are also engaged in modernizing their nuclear arsenals as well. Yet the issue has largely disappeared from public debate in a world lulled by the fall of the Berlin Wall and the dissolution of the Soviet Union. The committee believes that this in turn contributes to an increase in the pressure of public opposition to the proliferation of atomic weapons and to a redefining of priorities, with greater attention being paid to health and other humanitarian issues. Such an awakening of public opinion as is now apparent both in the East and the West, in the North and in the South, can give the present arms limitation negotiations new perspectives and a new seriousness. In this connection, the committee attaches particular importance to the fact that the organization was formed as a result of a joint initiative by Soviet and American physicians and that it now draws support from the physicians in over 40 countries all over the world. On October 15, at Tufts University in Boston, just two weeks before the historic UN vote to begin negotiations in 2017 to outlaw nuclear weapons, the US affiliate of IPPNW, Physicians for Social Responsibility (PSR), with the sponsorship of all the city’s medical schools as well as nursing schools and state and local public-health institutions, revived PSR’s distinguished heritage at a symposium modeled after the earlier ones that had put nuclear disarmament front and center in the public consciousness and led to the largest demonstration in history when over 1 million people showed up in Central Park in 1982 in NY and called for a nuclear freeze. 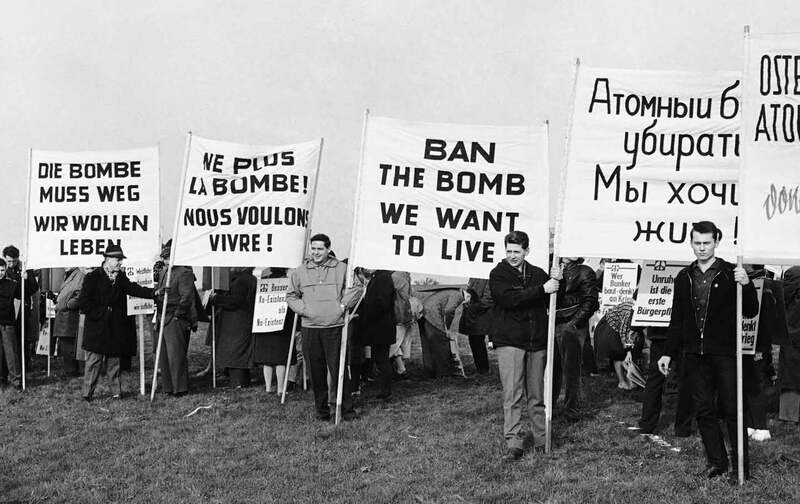 In this new millennium, the symposium was organized to address the links and similarities between nuclear war and catastrophic climate change. Dr. Susan Solomon, of MIT, delivered a brutal overview of projected environmental catastrophes from the effects of growing carbon emissions—air pollution, rising sea levels, more frequent and severe droughts, the destruction of the very fertility of our soil…—noting that in 2003 more than 10,000 people died in Europe from a protracted and unprecedented heat wave. She demonstrated the inequality between haves and have-nots with evidence that 6 billion people in the developing world produce four times less CO2 than the 1 billion people in the developed world, who, with fewer resources, will unjustly be unable to protect themselves from the ravages of climate change—more floods, wildfires, soil erosion, and unbearable heat. Dr. Barry Levy, at Tufts University, demonstrated the devastation that would be wreaked on our food and water supplies, with rising cases of infectious diseases, mass migrations, violence, and war. Dr. Jennifer Leaning, at Harvard University, explained how the war and violence in Syria was initially caused by a drought in 2006 leading to massive crop failures that precipitated mass migrations of over 1 million northern Sunni Syrian farmers to urban centers populated by Alawite and Shia Muslims, creating unrest and the initial impetus for the devastating war now raging there. Bill McKibben, founder of 350.org which encircled the White House to protest global warming and organized marches with millions of people around the world to halt climate change, reflected, via Skype, that with the coming of the bomb, humanity’s relationship to the earth changed from the vision of the Old Testament’s book of Job— how weak and puny man was in relation to God. For the first time, humanity has achieved overwhelming power to destroy the Earth. Nuclear war and climate change are our two greatest existential threats, since both of these man-made catastrophes, for the first time in history, could destroy the human species. Dr. Zia Mian, at Princeton University, outlined the frightening prospects of nuclear war between India and Pakistan, which is more likely now that climate change is already affecting their access to clean water. The 1960 Indus Water Treaty regulated the three rivers flowing out of Kashmir between the two countries. India and Pakistan have had a series of wars and skirmishes since 1947, and after a recent attack on India by Pakistani terrorists, the Indian government warned that “blood and water cannot flow together,” threatening to block Pakistan’s access to the rivers. Dr. Ira Helfand, xhair of PSR’s Security Committee, presented a gut-wrenching cascade of facts demonstrating that even the use of only 100 nuclear weapons would cause a steep drop in temperature, causing crops to fail and producing global famine and the death of possibly 2 billion people. Helfand has presented these shocking facts to governments examining the humanitarian consequences of nuclear war in the series of international conferences that led to this week’s UN vote to hold negotiations to ban the bomb. PSR’s executive director, Dr. Catherine Thomassen, presented information on the medical responsibility to act. She noted a poll that showed that from a list of professions the American public selected nurses, pharmacists, and doctors as those they respected the most. She urged the participants that this was all the more reason for them to take action. John Loretz of IPPNW, whose Australian affiliate initiated the campaign to outlaw the bomb in 2007, www.icanw.org, reviewed the stalled “progress” in nuclear disarmament over the years leading up to this week’s historic vote. Adopting a resolution to ban nuclear weapons, just as we have banned chemical and biological weapons as well as landmines and cluster bombs, may be the most significant development since the end of the Cold War. It will stigmatize the bomb in a new way and put grassroots pressure from their parliaments on other states in the US nuclear alliance who are being heavily lobbied by the United States to resist this initiative—NATO members as well as Japan, South Korea, and Australia—to come out in support of the ban, as just occurred this month with Sweden, which was persuaded to vote in favor of starting the ban talks, or to abstain from voting against the ban, as the Netherlands did, even though it is part of the NATO alliance that relies on nuclear weapons in its security policy. One way citizens in the nuclear-weapon states can support the ban is to check out a new divestment campaign from institutions that rely on nuclear weapons manufacturers, Don’t Bank on the Bomb. For those in the United States, Loretz urged that we start a debate on our military budget and the obscene trillion-dollar projection for nuclear weapons over the next 30 years. It is still clear that if the ICAN campaign actually fulfills its goal for the successful abolition of nuclear weapons, we need a change in the current US-Russian relationship which has deteriorated so badly in Obama’s second term. One reason the Nobel Prize was awarded to the IPPNW physicians in 1985, as set forth in the citation, was “the fact that the organization was formed as a result of a joint initiative by Soviet and American physicians and that it now draws support from the physicians in over 40 countries all over the world.” While IPPNW still has an affiliate in Russia, the Russians physicians have been inactive on this issue. Just as the US affiliate, PSR, has only recently refocused on nuclear issues through the ban campaign and the new humanitarian initiative, efforts will be made to renew relationships with Russian physicians, and to also develop possibilities for meetings with physicians in the Asian nuclear-weapon states that took the world by surprise when four of them broke with the big-power nuclear consensus, to block negotiations on a nuclear -weapons ban, by either voting to abstain on the resolution or by actually voting in favor of moving forward with the talks. Editor’s Note: When published, this article erroneously claimed that 126 nations had voted to move forward with negotiations to prohibit and ban nuclear weapons. In fact, 123 did so. The article has been corrected. Alice SlaterAlice Slater is the New York Director of the Nuclear Age Peace Foundation, and serves on the Coordinating Committee of World Beyond War.